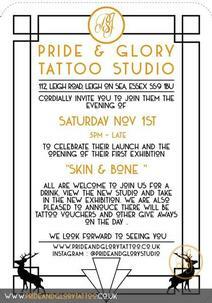 Pride & Glory are proud to announce their launch event and first exhibition on Sat 1st November. With a party event being thrown to celebrate our launch, thank all our customers for their support and welcome everyone to the new shop. 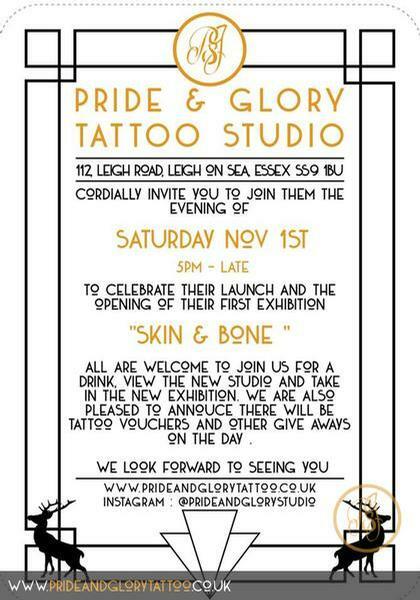 As well as our first exhibition , all are welcome to attend ; Pride & Glory Presents Skin and bone : the show explores the tattooists canvas: the living body and brings together a collection of artists exploring the anatomical canvas, the tattoo art world and the subcultures that surround it. The exhibition looks to be a a amazing collection of local ,national and international artists. With live music acts being confirmed for the evening, as well as goody bag giveaways to everyone who attends. Which will be including tattoo gift vouchers. Join us for a drink, some amazing musicians and equally incredible art as we raise a glass to Pride & Glory, and all its customers present, past and future.